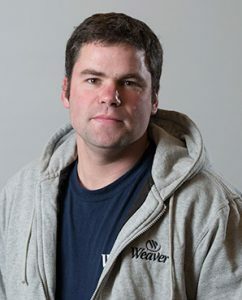 Featured Employee: Construction Foreman and Construction Superintendent Keith Garman | Weaver Companies, Inc.
Because the Weaver team is experienced, talented, and willing to jump in and help at a moment’s notice, wearing multiple (hard) hats is a common occurrence. Keith Garman primarily works as a Construction Foreman but has recently been serving as a construction superintendent. Read on to learn about why Keith loves residential construction, his favorite restaurant in New Holland, and the bow he uses for hunting. Most of the time, we meet in the morning and get what’s needed for the day. Then we work on various parts of the project. Some of the time, I spend my days meeting with subcontractors or clients. I would say the work atmosphere, and I enjoy working outside when the weather is agreeable. Also, there’s a satisfaction to leaving behind a new and improved space for the homeowners we work with. Some of the projects require a lot of demolition. Also when we need to temporarily cover up a home due to bad weather before we get the roof on — that’s no fun. Why do you like residential work? It’s what I started with, and I found out that I enjoy it. You get a little more day-to-day to contact with homeowners. That’s a good feeling, too. How does your job inspire you? It inspires me to do the best I can. I enjoy being part of a process that leaves a new and improved home behind for the client. It’s a good experience. Weaver provides a good atmosphere, and they care about their employees. The coworkers are great! I am married with three children. The oldest is a boy — he’s five. We have two girls that are three and a year and a half old. We’re expecting another child in June. Where’s your favorite place to go out to eat as a family? One of my favorite places is local and close to home. It’s called the Squire Side in New Holland. I enjoy the going to a cabin with friends and family. We occasionally go to the beach. My favorite beach is Lewes, Delaware. It’s family friendly, and the children are able to swim in the water because the waves aren’t as rough. What do you like about archery hunting? It’s a great time of the year to be in the woods, and a great break from life and its daily stresses. I primarily hunt deer, but I’ve hunted turkey and bear as well. What kind of bow do you use? A Hoyt UltraTec — it’s about 12 years old, but it still works great. That’s a tough question. I’ve really enjoyed wakeboarding in the past.